The total number of animals has halved since the 1970s in what some scientists have termed the start of Earth’s sixth mass extinction. Seismic eruptions, ice ages, continental collision and asteroid impact are thought to be some of the causes of the previous five mass extinctions. This time though, humans are to blame. Never before has a single species exerted such influence on the planet and the evolution of its inhabitants, or put its own survival in such jeopardy. Biodiversity underpins life as we know it, including the air that we breathe, the food we eat and the water we drink. Here are just three of the many reasons we should all care about biodiversity. Nature provided the resources necessary for humans to emerge as the planet’s dominant species and we continue to depend on its bounty to thrive. The complex system of relationships between plants, insects and animals has held nature in balance for millions of years. But soaring consumption has placed unprecedented strain on the planet’s resources. Human activity is disrupting whole ecosystems – as large as the Great Barrier Reef and as small as the parasites living on a crab’s shell – or causing them to disappear altogether. Man-made problems like pollution, climate change and deforestation are threatening more species. 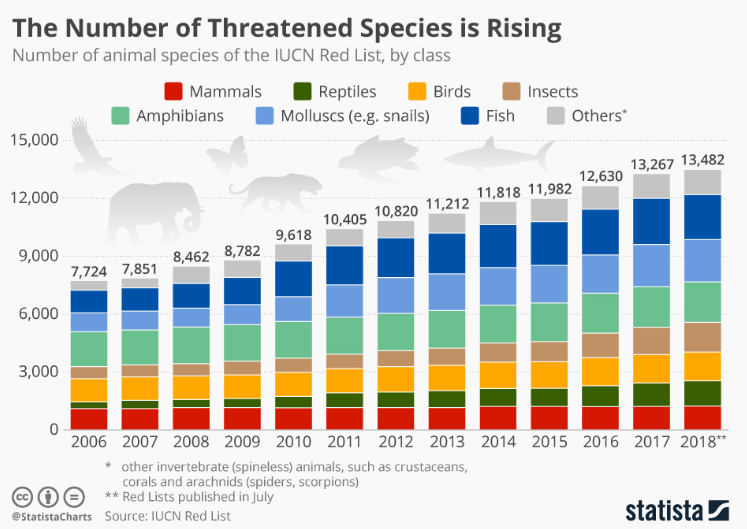 The number of mammals listed on the International Union for Conservation of Nature’s (ICUN) Red List increased by 12% between 2006 and 2018. During the same period, endangered insect species rose by 147% and molluscs by 125%. Losing just a single link in nature’s intricate network of relationships can create a domino effect that disrupts entire food chains. Bees, for example, are prodigious pollinators, but the use of agricultural pesticides has caused their numbers to decline drastically. And as animals pollinate 87% of the world’s flowering plants, many of which provide food for humans, this problem isn’t only confined to bees. Food sources are under threat in the oceans too. Coral reefs shelter 25% of all marine life and form nurseries for a quarter of the world’s fish species, including those that end up on our plates. Coral is a living organism that feeds on nitrates, produced by bacteria recycling dead matter. Rising water temperatures from climate change and pollution harm some strains of bacteria and starve the coral of nitrates, damaging or killing reefs and many of the species that depend on them. Overfishing and destructive practices like dynamite fishing and bottom trawling are depleting fish stocks and other marine species. The WWF estimates the global fishing industry has taken 6 billion tonnes of fish and invertebrates from the world’s oceans since 1950, but catches have been declining by 1.2 million tonnes each year since 1996. Rising sea temperatures are also contributing to reduced catches, as fish migrate from their natural grounds to seek cooler waters elsewhere. This means boats have to spend longer at sea and jobs are in jeopardy. Closer to shore, mangrove forests are disappearing, along with the livelihoods of the people who depend on them. Home to thousands of marine species, birds and mammals, mangrove swamps are being cleared to create agricultural land or to build urban developments. Mangrove wood has been harvested for centuries but unsustainable practices have caused irreparable damage to many forests. Philosopher Brian Norton has likened Earth’s current crisis to a patient connected to a life-support machine while hospital staff sell parts of that machine to generate much-needed income. Unless we change our relationship with the planet, one day the machine on which we all depend may stop working. This article was first published by the World Economic Forum, on April 11th 2019. Read the original article here.